Big Body Play, the sometimes rowdy, always very physical running, rolling, climbing, tagging, jumping, grabbing, and wrestling that most children love and many adults try to shut down can and should be an integral part of every early child setting. 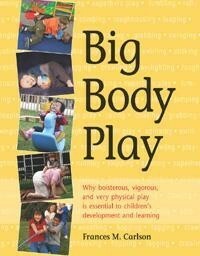 Drawing from evidence-based practice and the latest research, this book explains the multitude of benefits of big body play for young children’s social-emotional, cognitive, and physical development. Also learn how to organize the physical environment, set rules and policies, and supervise the play. Why big body play is essential? What kind and how much physical activity?